What's more important to you when you're hungry and can't be bothered to cook, that the food tastes good or that your takeout gets to you fast? Obviously in an ideal world you don't have to choose between the two. 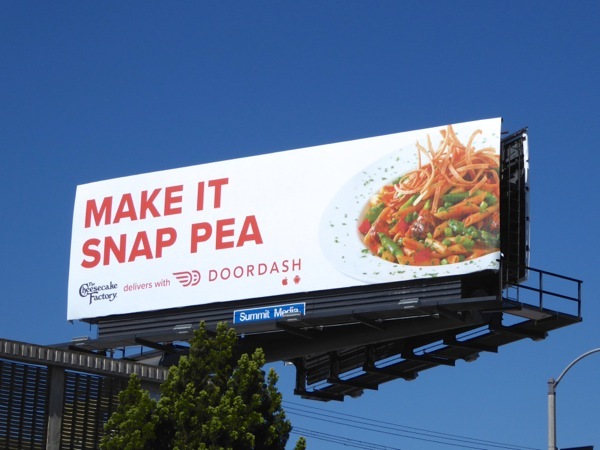 Lately there's been a new food home delivery service, DoorDash, advertising their speedy service in the L.A. skies to tempt you with your favourite takeaway meal in the comfort of your own home. 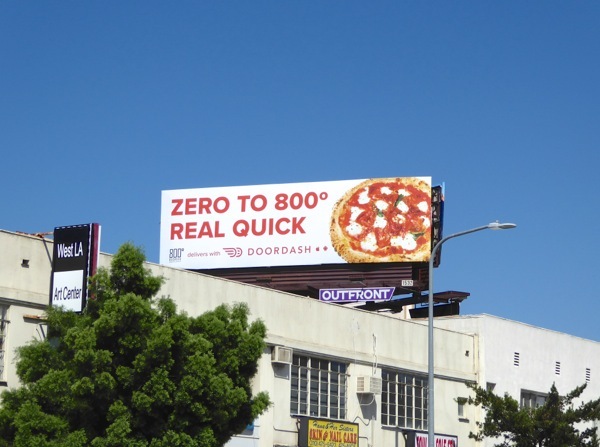 Hungry for pizza, a sandwich, or a meal from your favourite eatery, you got it in a hurry. 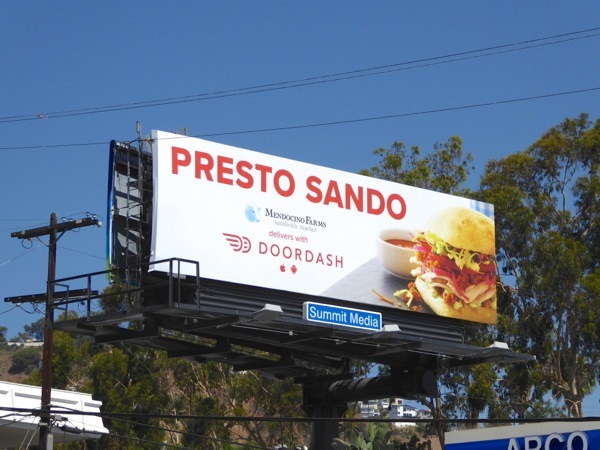 These DoorDash food delivery billboards were photographed along Westwood Boulevard, Pico Boulevard and Sunset Boulevard from July 19 to July 27, 2016. 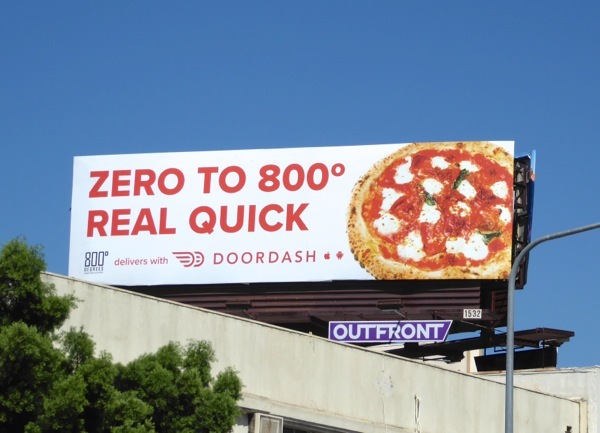 These are not the first billboards to offer 'fast' food delivery either, as different online and app services have been spotted in recent years as technology has improved and startups have emerged seemingly out of thin air. 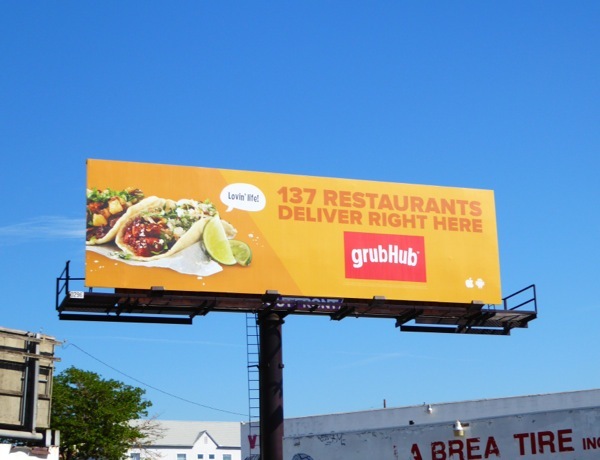 This taco ad creative for GrubHub offering a wide selection of restaurants, although not the greatest billboard design, was photographed along La Brea Avenue on October 9, 2015. 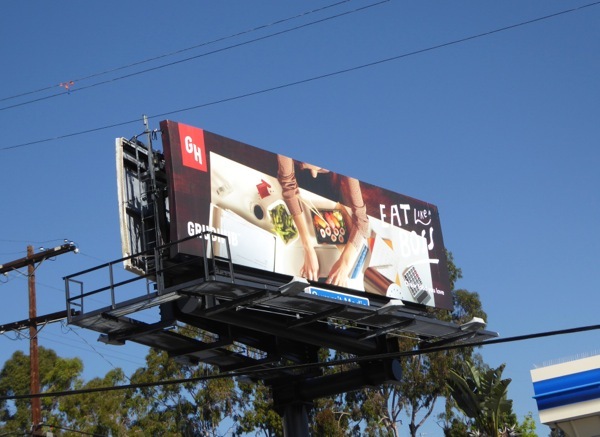 This was followed by a much more sophisticated lifestyle series of ad creatives from GrubHub, like this sushi workplace billboard spotted above Sunset Boulevard on March 17, 2016. 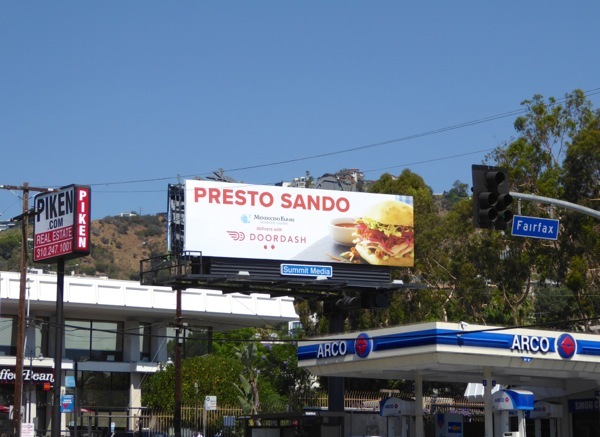 Meanwhile this simple, but complimentary body image billboard for Yelp's Eat 24 service was spied along Pico Boulevard on November 17, 2015. As they say, flattery will get you everywhere (or at least encourage passersby to order takeout). 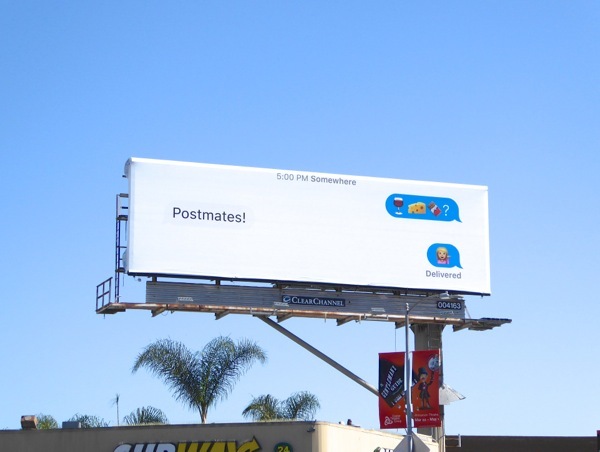 More recently on-demand courier service Postmates got into the food delivery game to your workplace or home. 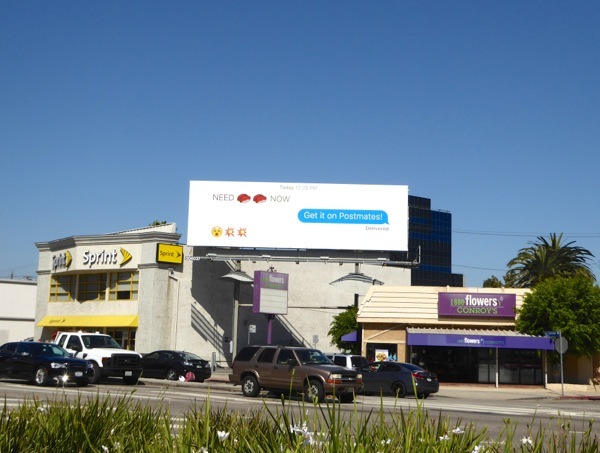 This fun emoji-themed text ad campaign was snapped above Santa Monica Boulevard in West L.A. on March 12 and along La Cienega Boulevard on April 2, 2016. 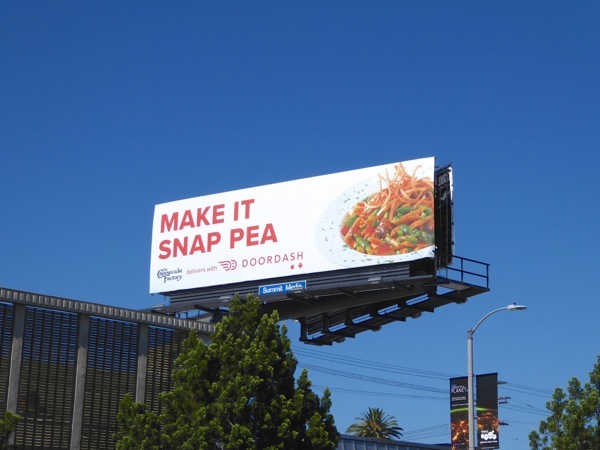 With more and more entrants into this market, for example from ride-sharing apps like Uber and online retailers like Amazon Prime diversifying their offering, plus more venture capital being invested in startups to allow them to advertise we guess the skies will continue to be filled with these foodie-themed ads for some time to come (that is, until someone starts consolidating the market). What's your favourite online food delivery service or app, and who do you think has done the best job of selling themselves? All this talk of food has made us hungry. What about you? It's the weekend, go on, treat yourself. 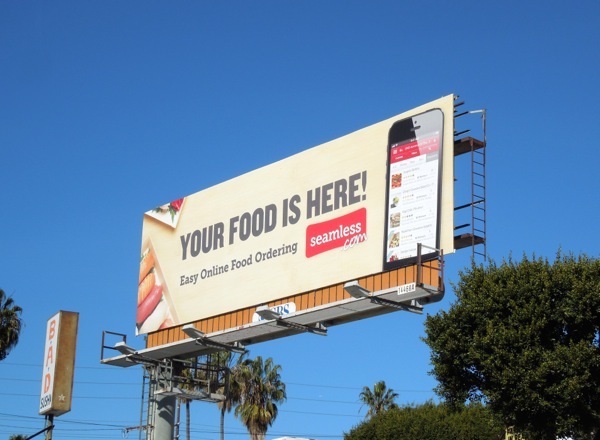 UPDATED: Here's also a Seamless food delivery billboard from along Santa Monica Boulevard in West L.A. on January 18, 2013, which later merged with GrubHub the same year.